In the mean time you can follow along with these simple step-by-step photos and breakdown of instructions to get on your way to Mishima success! Of course, feel free to adapt any and all techniques that you see fit. Bonne Chance as they say in these parts! 1. Tracing your image. Choose an image...any image. It can be on paper or, if you are lazy like I am, you can pull up an image on your computer and work right from the screen! Cover your image or drape your computer screen with a light, clear plastic. I find Mylar or acetate a little too stiff for my liking and plastic painting drop cloth too thin, but clear, plastic garbage bags are juuuuuust right. Take a fine point permanent marker and then trace the image. As you can see you can get pretty detailed, but when you transfer the image you can edit out details here and there if you like. A word about images and copyright. Whenever possible, hunt for "public domain" images on the internet that are truly free of licensing rules and regulations. These can come back to haunt you if you are not careful. One of my fave graphic sites is The Graphics Fairy, but there are so many others to peruse out there. 2. Transferring the Image. Now that you have your image transferred onto plastic you can now endeavor to get it onto the clay surface. I like to work with a ceramic surface that is a little beyond leather hard; in fact, I like to call it cheddar "cheese hard". It is somewhere between too late to add a handle, but not too late to make a mark on it with your finger nail. Capisce? Now take a dampened, not drenched, sponge and give the area a quick swipe to create a slightly tacky surface for the plastic to stick to. This will make it easier to keep the image in place while tracing. I then take a wooden trimming tool that isn't too sharp at the point and then trace the image. Go light with your touch though! There is no need to dig the tool in as a) you will drag and rip the plastic rendering it useless for future use and b) you only need to transfer a faint line as it will be traced and made more visible with your calligraphy pen. A side note: I use some of my traced images many times over on many different forms so I often add and drop lines to make each piece somewhat different than the next. And of course you can always flip the plastic sheet around to get a reverse/mirror image for something different. Easy peasy, one, two, threesy! 3. Altering the calligraphy nib. On the left you will see the original and the right is the altered nib! I want you all to go buy the latest issue of ceramics monthly, but here's an exerpt til I can edit it!! of us amateurs incited the visual equivalent of nails on a chalkboard...The horror! The horror! exacting edge (thanks to ceramic artist Katrina Chaytor for that tip). pen in my studio, but it was there and the idea to use it for line making poked me in the eye! quick few strokes against the silicon-carbide surface from time to time . to always look at things from another angle!" I use a larger yogurt container and add lots of water...think skim milk consistency. Things will settle at the bottom but use your hake brush to stir things up well before applying to your piece. Use broad, deft strokes to cover any all the incised lines. Again, there is no need to use this stain in a thick manner...think thin. I have found if you make the mix too thick or pasty, it clogs up you nice line work. 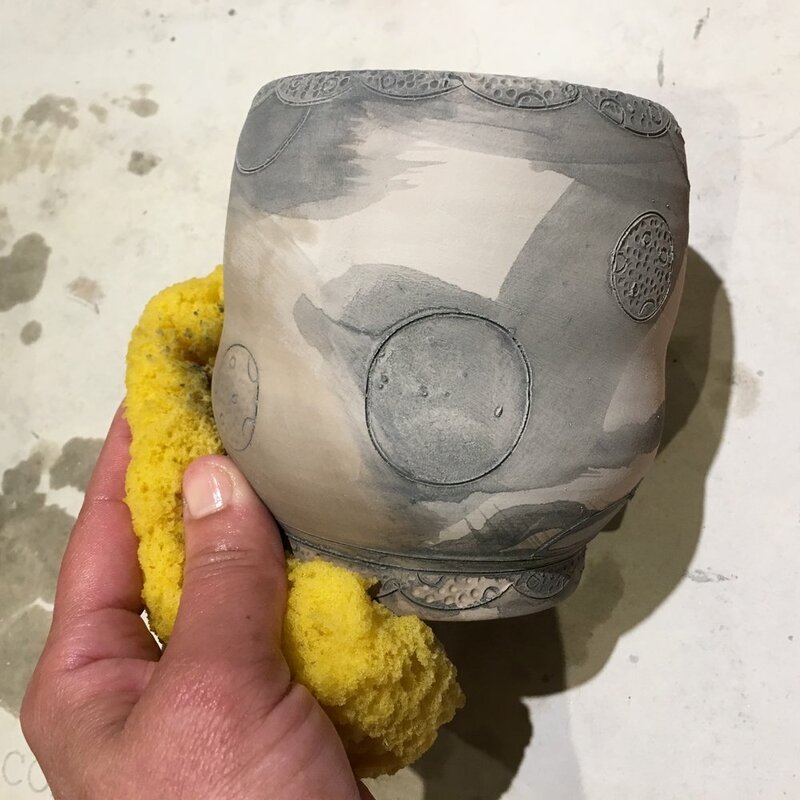 Later on, when the piece shrinks during its glaze firing, the use of too much stain can cause a sort of spurting effect from the lines as it squeezes and pops out during the firing...yuck. After brushing on the stain mix, leave the piece to set up....like overnight. Seriously. The reason for this is that if you wipe it out soon after you apply it you will drag most of the damp stain out. So resist the urge to wipe prematurely and go have a martini and watch Netflix or something for the evening. 5. Stain Off. After letting the piece set up overnight, you are ready to "wipe off!" Fill up a bucket of water and find yourself a sponge first. You are going to want to dunk the sponge and wring it out of most of the water so that is more damp than wet. The key to sponging off the stain is to use each side of the sponge only once as repeated use of the stain-soaked sides will just result in smearing that will create a black haze. So this is your mantra... "Dunk, Squeeze, Swipe, Swipe" and then repeat. If you can let them sit for a couple more hours and then give the pieces a last, quick once-over before loading them to bisque, it will greatly help to cut down on the sanding you will have to do post-bisque. 6. Sanding. Blech...a necessary evil. Pull out your dusk mask because it is sanding time!!! I like to use torn up sheets of 100 grit sandpaper first( to get rid of and residual stain haze) and then proceed to 150 grit to smooth things down. After your piece is sanded and soft as a baby's bottom be sure to rinse thoroughly under running water to get all the dust off. A note about my brush choice and use. I love the rounded tip brushes that the Windsor and Newton, Cotman Watercolor Series has to offer. They are nice and soft and opposed to hard and scritchy. 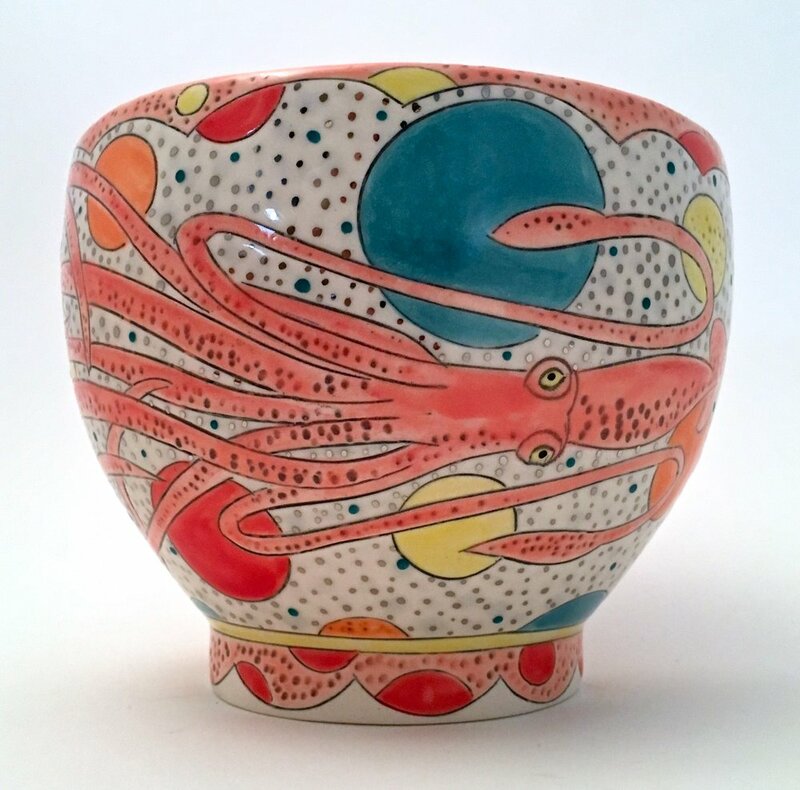 When using them I load up the brush with underglaze and then, more so than drag it across the bisque surface, I apply the glaze with more of a dabbing, mopping motion. Sort of like lightly swabbing the deck, This, I find, helps to cut down on harsh brushstroke lines. 7. Glazing and Beyond! After letting that piece set up overnight with its underglaze application, I like to wax the bottoms (totally optional) and then dunk them in my fave Cone 6 Clear Glaze recipe, Zakin's Clear, mixed to a consistency just a little thinner that whipping cream. (Note: With the presence of Gerstley Borate, it is good practice to sieve your glaze from time to time to avoid little clumps of GB) After the glaze dries, a little wipe of the bottom of excess glaze with render that piece good to go! To note: I know some artists like to crash cool their kilns, but to avoid crazing, exercise patience and let your kiln cool right down before peeking.